Armour Upper Hull Front: 13mm. Notes The US military required a light wheeled armoured vehicle for use in their new mechanised cavalry units. This was to act as a scout vehicle in the reconnaissance units. After trials the M3 was adopted for this role and the improved M3A1 was introduced in 1940. The M3A1 provided good mobility and could carry a crew of two plus up to six in the open fighting compartment. It could mount up to three or more machine guns which ran on a skate rail. It was protected by armour ranging from 6.4mm to 13mm. One of the main draw backs was the lack of rear doors. The US 7th cavalry brigade was the first unit to be supplied with the M3 with the army deciding on the M3A1. 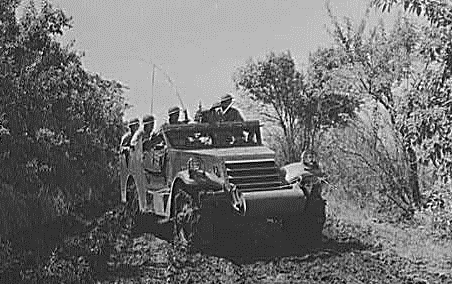 The M3A1 Scout car was used in the early stages of World War Two, but with the increasing numbers of half-tracks available it was soon relegated to a rear echelon role, many were also issued to allied armies.